You think she heard your cries for some color yesterday? Maybe that wave was just for you. 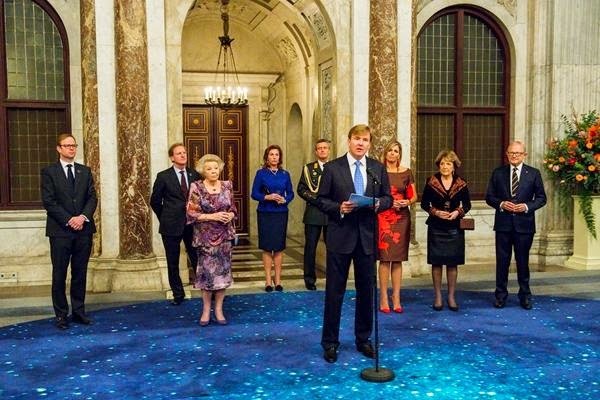 A bright red Queen Máxima kicked off the year at the annual New Year's reception with Princess Beatrix (in her patterned best), Princess Margriet (in a particularly rich-looking jacket), plus the King and Pieter van Vollenhoven (in...wait for it...suits). The Natan dress is a repeat, of course, worn this time with more refined shoes and a bigger statement earring. She's swapped rubies and diamonds for a gift from Dutch jeweler LOTT. gioielli, and while I always miss rubies and diamonds when they're gone, it's nice to see her lend her support to brands close to home. Good then, good now. Welcome back, Máx.